This Early Christian church lies near the village of Moni. The interior wall surfaces have wall paintings of various phases; from the end of the 6th and the beginning of the 7th centuries. Apirathos is known as the White City because nearly everything there is built from white marble from the island's famous quarries. Even the gravel on Naxos is crushed white marble! Apirathos is on a hill and has narrow winding paths that are fun to navigate. The town was colonised in the 17th and 18th centuries by Crtean refugees trying to get away from Turkish oppression. It really is a wonderful mountain village with marble paved climbing streets which are so easy to get lost in, and 14th century towers which were built by the Venetian Crispi family. 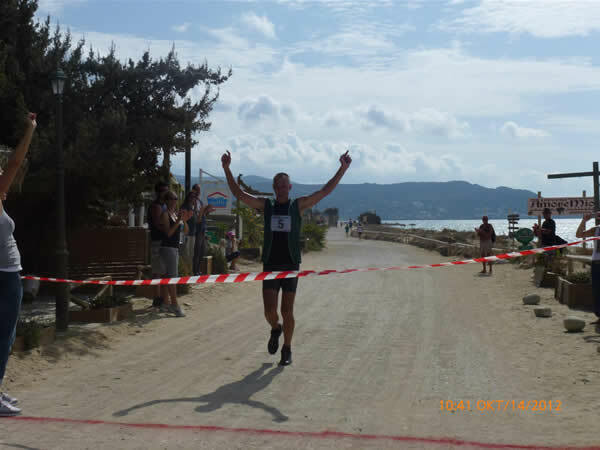 The oldest person to take part in the Second Naxos Duathlon on Sunday 14 October, won the event. Englishman Ian Spencer, 50, who runs East-West restaurant in Naxos town with his wife and duathlon co-oraniser Lotta Blombergsson, is seriously competitive and had been training for several weeks. Close on his heels in second place was Simo Zak, a merry 41-year-old Moroccan who lives and works on the neighbouring island of Paros. Zak is known to do a minimum of 8 hours of hard labour in the full heat of the Greek summer sun with no breaks for food, and set off on a 2-hour run immediately afterwards. In third place was Thanasios Filios, a youngster of 21, who came third, and claimed not to have trained at all. Another 50-year-0ld, Spanos Stephanos, was in 5th place. Youngest entrant was Manolis Moustakas, who turned 15 on the day. He came 22nd , one up on his placing in the First Naxos Duathlon in April, but is clearly someone to watch in the future as he grows in stature and strength. He trains twice a week, is a member of the Naxos athletics squad, and his ambition is to be a professional multi-disciplinary athlete. In August I was in London for the Olympic Games; two months later, a spectator at the Naxos Duathlon, a local Greek island event with 36 competitors, organised on a shoe-string by two women who wanted to give their sporty husbands something to train for. Both events had committed athletes, enthusiastic volunteers, and a range of nationalities. Most of the Naxos participants were Greeks, supplemented by handfuls of German and English, two Italians, a Norwegian, an Albanian, a Moroccan, and a French woman. Maria Manaki, a dietician, and Christos Papanikas, a telecommunication engineer, travelled from Athens especially for the event. Picasso Restaurant, Plaka Beach hosted the event. Owners Debbie and Stratos Perakis were both Duathlon participants, Debbie as a tireless and cheerful co-organiser, and Stratos as a competitor who came in a magnificent 10th. The restaurant’s foredeck was packed with rows of numbered chairs - the ‘station’ for each competitor, each one with a banana and a bottle of water. There were many more chairs than competitors, but this was a Duathlon that was pitched as being ‘accessible to everybody’ (ie.,who’s reasonably fit and prepared to train for at least a month), so they had to be prepared in case of a last-minute rush of athletic tourists. The race couldn’t begin until seven men arrived from neighbouring Paros on the morning ferry, already in a sweat after c. 6km dash by bike from the harbour. Ten minutes later, a wobbly line of red paint was sprayed across the dirt track that runs alongside Plaka beach. The track-wide pack of competitors shuffled and jostled nervously. An over-eager young Greek made a false start, mistaking a barked order to line up from the starting marshal. Beyond the thin line of spectators and volunteers (about 15 of each) were parallels of cream sand, white-tipped waves, blue band of sea, and Paros filling the horizon. Ian Spencer was first to in sight after the first 3km run; he leapt on his bike with ne’er a glance at cheering spectators (and officials) and was still ahead after the two 6m laps of cycle course. At this point, Simo Zak was well behind the front-runners, but in the final 3km run he overtook those ahead one-by-one, apart, of course, from the champion. “I never beat Ian,” he said, “but I’m happy to see him win; he’s a really strong biker. I’m more of a marathon man, myself, but we come over from Paros to support Naxos. If you are thinking of entering the next Naxos sports event, you may like to know that Ian always stokes up with a pasta meal the evening before a race. “The carboydrate converts into energy-giving reserves of glycogen in the muscles,” he explained. His breakfast, though, was nothing special “for such a small event,” just a bowl of muesli. 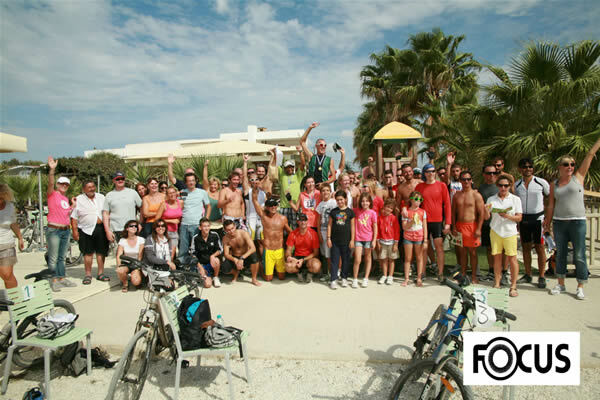 The Naxos Duathlon was not all to do with winning. For some, including the three women who took part, it was about the achievement of completing the course: no mean feat in humid 25 C-plus heat, and about attaining a fitness goal. Two years ago, Ioannis Nafpliotis was not a slim man, and his exercise consisted mostly of tinkering with the quads and scooters he hired out to summer tourists. Increasing demand for decent mountain bikes prompted him to transform both his business and his body. He dropped the motorised stuff, changed his business to www.naxosbikes.com , and got on his bike. Over a single winter’s serious cycling around the island, mountains and all, he transformed himself into the lean, 47-year-old muscle machine he is today. Ioannis came 12th in Sunday’s Duathlon. His wife, Soizic, 43, was first of the women over the finishing line. Whatever their placing, everyone who took part pushed themselves to their personal limits; at the end, muscles cramp, and the physical strain can make you feel sick or dizzy. Fortunately, Naxos masseuse Maria was giving free treatment to competitors, loosening up vital muscles beforehand and release tension afterwards. And maybe one day, there’ll also be men and women from Syros, Amorgos, Tinos, and other islands to build up gradually (like the recommended training) into a bonding, pan-Cycladic sporting event.